Microsoft Excel is a spreadsheet application that has powerful tools to control data, including sharing workbooks, advanced chart features, PowerView, Slicers and timelines. Microsoft Excel 2013 Expert Training Course guides you through every basic and advanced function of Excel 2013 using snapshots, examples and explanations to help you quickly gain mastery of the software. The course provides comprehensive training in creating Arrays, working with macros and forms, advanced chart features, formatting slicers, workbook calculations, and more. 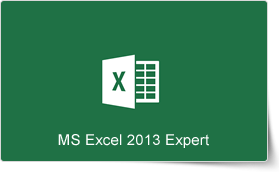 This Microsoft Excel 2013 Expert Training Course can be delivered at your premises by one of our expert local or international trainers or live online using our HIVE technology. During this training course, participants will learn how to use various functions of Microsoft Excel 2013, including understanding permissions, creating and running a macro, analyzing data using multiple tables, using trend lines, creating a form using various controls, performing advanced formula auditing and calculations, and working with slicers. To facilitate easy learning and the retention of knowledge, the training course includes a step-by-step explanation of procedures, the use of each feature, snapshots, and review questions.